At TV Plumbing, we provide water heater replacement, water heater repair, and installation services to homes and businesses throughout greater Los Angeles. 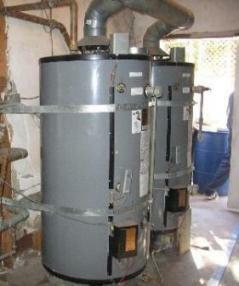 Keeping your Los Angeles water heater in good condition makes the equipment last longer. It also helps to detect problems early, such as a rusting casing that may be leaking in the near future. If you have a gas water heater, maintenance is important for those reasons and to maintain the gas lines and connections. Water heaters will need to be flushed out at times as well, especially if there is no water softener installed that serves the hot water supply. Sediments can build up inside the water heater, and turn into scale that coats everything. Scale covered heating elements will burn out when coated enough. And, your pipes could suffer as well. Whether you have a gas water heater or electric water heater, repairs are no problem for our skilled, licensed, insured, and certified Los Angeles Plumbers. Until the hot water heater fails, you may not know it is in need of repair. Our professional Los Angeles plumbers can help you install a new water heater if you are adding onto or constructing a home. We'll make sure your new water heater is installed correctly whether it will be powered by gas or electric. We'll also ensure that you have the right size and type of water heater according to your needs. If you haven't considered getting a tankless water heater, now is the time. They will save you space and energy costs while giving you instant hot water on demand. Many people believe tankless water heaters are only good for adding on to the home or a guest house, but the truth is that today's whole home tankless water heaters are way more advanced so they can serve the entire household's needs very efficiently. Whether your Los Angeles water heater has sprung a leak or is just getting old and worn, a replacement should solve your problems for some time. At TV Plumbing, you'll never have to wonder whether we are telling you to get a new water heater when it could be repaired. We treat our customers with honesty and respect, which is how we have built our successful business since 1982. At TV Plumbing, we provide water heater installation, repair, replacement, and maintenance services to residents throughout greater Los Angeles. Our certified plumbers offer many options in quality water heaters and use quality repair parts to ensure you have reliable hot water. No matter your water heater needs, we've got you covered.